A type of immunotherapy, CAR-T therapy galvanizes the body’s immune system to fight cancer. It uses genetically engineered immune T cells to recognize specific proteins on tumor cells. Some of a patient’s white blood cells are extracted, modified, and replicated so that they recognize and attack cancer cells. 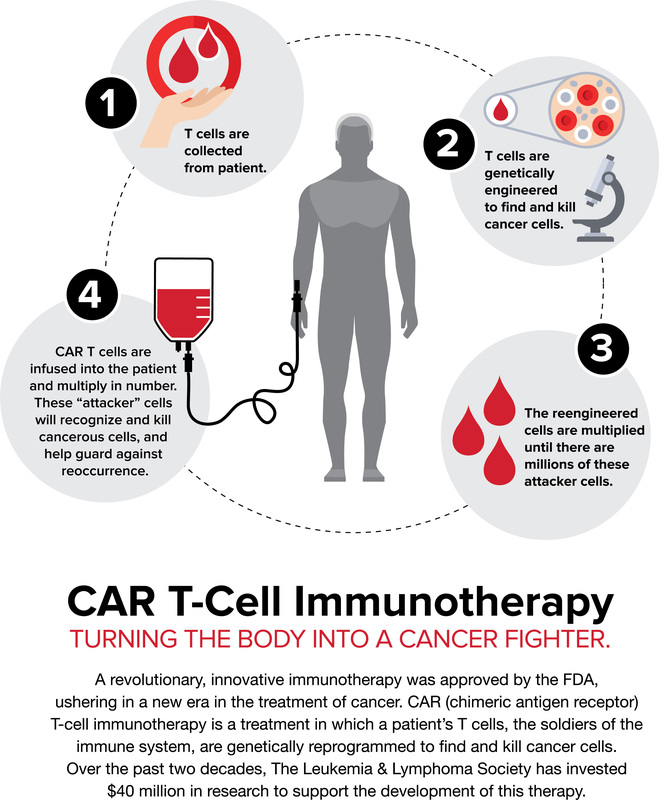 View an infographic that explains CAR-T therapy here. CAR-T provides another treatment option when standard treatments are not effective. Adult patients who have been diagnosed with either relapsed or refractory large B-cell lymphoma, a type of non-Hodgkin lymphoma, or acute lymphocytic leukemia, and who have failed two or more types of therapy may be eligible. CAR-T clinical trials may be available for other hematologic malignancies or solid tumors, including non-Hodgkin lymphoma, acute lymphocytic leukemia, multiple myeloma, chronic lymphocytic leukemia, pancreatic cancer, and others. Texas Oncology offers CAR-T therapy at two Dallas area locations, through collaborations with Baylor University Medical Center and Medical City Dallas Hospital. Texas Oncology-Medical City Dallas Blood and Marrow Transplant at 972-566-8141 (Chris Nelson, BSN, RN - CAR-T Coordinator). Patients who are eligible for CAR-T treatment and who live outside the Dallas area may be able to access CAR-T treatment experts via telemedicine, in conjunction with a local Texas Oncology physician in the patient’s community. In some cases, patients could receive initial consultations and assistance with managing aspects of follow-up care via telemedicine. While this may provide added convenience for out-of-town patients, patients will need to travel to Dallas for treatment. Learn more about telemedicine. Learn about Following are some frequently asked questions regarding CAR-T therapy. The following Texas Oncology oncologists and locations specialize in Car-T Therapy.